The author is an assistant professor in the department of biology at Utah State University. 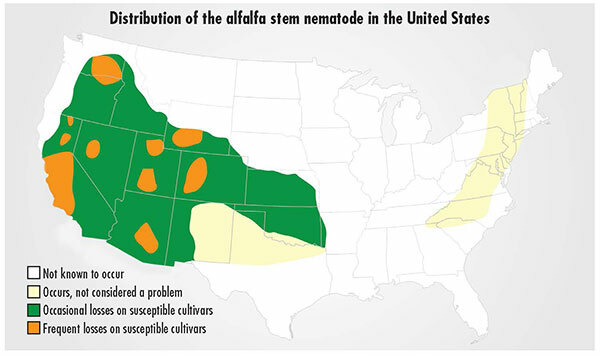 Alfalfa stem nematodes are not new pests to alfalfa but the problems associated with their presence have appeared to be more persistent in recent years. Stem nematodes are translucent, nearly microscopic roundworms that inhabit the soil. 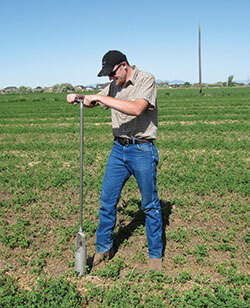 Unlike many of the other plant parasitic nematodes that attack roots below ground, stem nematodes infect the crown and stems of alfalfa plants above ground. 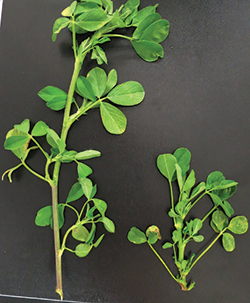 Some specialists have attributed their renewed primary pest status to changes in available broad-spectrum pesticides once used in alfalfa, such as carbofuran that had nematicidal properties, to products with shorter residual activity and no soil activity. Stem nematode-infested alfalfa plants are stunted and have swollen nodes and shortened internodes. This is also accompanied by small leaves and, in heavy infestations, “white flagging” or leaves that appear bleached. Across the landscape of an alfalfa field with stem nematode, there are stunted, slow-growing patches of alfalfa. Most of these symptoms show up in the early spring when temperatures are cooler, 59 to 70°F, providing a preferred habitat for stem nematodes to develop and reproduce. Although stem nematodes do not do well when temperatures rise during the summer, the initial harm posed by stem nematode to alfalfa in the spring can linger and be seen in these patchy areas with each harvest. Although the total number of acres affected by stem nematodes is difficult to calculate, some research conducted in greenhouses has suggested upwards of 13 percent yield losses. Given the susceptibility of alfalfa to winterkill with high stem nematode infection, overall yield losses can be significantly higher. Healthy (left) and nematode stunted (right) alfalfa. A plant infested with nematodes shows symptoms of stem swelling and shortened internodes. The first steps in managing a pest problem are identification and monitoring of the pest. For nematodes this can be a difficult task given their tiny size. However, seeking out symptomatic plants can aid in finding them if they are present. It is important to gather a number of these symptomatic plants for inspection. If nematodes are present, they can be found by finely chopping the swollen alfalfa stems with a razor blade and letting the plant material sit in a small pool of water. The stem nematodes will be released from within the plant and wriggle around in the water. While this is easily viewed with a hand lens, with high infestations nematodes can be visible with the naked eye. Take note that plant hairs may look like nematodes, but do not be confused and recognize that stem nematodes tend to be very active and mobile. These steps provide the initial identification process that stem nematode may be the culprit but it is also encouraged to work closely with experts in the extension service who can help with definitive identification. There are many state departments of agriculture and universities with diagnostic support. Stem cuttings can then be used every season to monitor the progression of stem nematode infection. 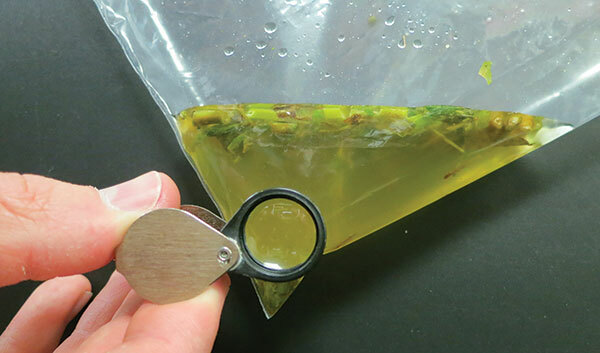 Extraction of nematodes from plants is easily done in a plastic baggie. With the bag held upright, stem nematodes will aggregate in the corner of the bag and can be seen with a 10X hand lens. Keeping alfalfa stem nematode in check is limited to general changes in plant and soil maintenance, although there are a number of ways to do this. The National Alfalfa and Forage Alliance (NAFA) provides alfalfa pest resistance ratings for many varieties, and alfalfa stem nematode is listed as a pathogen pest in some evaluations. In addition to selecting a pest-resistant variety, it is important to use certified seed and avoid “brown bag” seed. Stem nematodes have been recovered from unclean seed or “brown bag” seed and this provides a mode of dispersal for nematodes to healthy fields. Given the close relationship between nematodes, water and soil, it is important to understand that the movement of soil and application of water can also be a means of nematode spread. Nematodes prefer moist environments and are water loving. Therefore, strive to avoid runoff, long-term standing water, and, if at all possible, shared or recycled irrigation sources. There have been cases of runoff from nematode-infested fields moving downstream. Infestation of plants in these cases is evident closest to the irrigation source. Sprinkler irrigation, however, appears to have fewer issues with stem nematode spread. Harvest alfalfa when the top 2 to 3 inches of soil are dry to reduce nematodes from reentering the soil as the plant dries. Sanitation of equipment and machinery that comes in contact with soil from nematode-infested fields can help prevent nematode inoculation of new areas. Power washing equipment, harvesting uninfested alfalfa fields first, or harvesting a grass field following an alfalfa harvest can reduce contamination. It has also been suggested that stem nematodes can be moved by grazing animals and in uncomposted manure. infested field is out of alfalfa, the longer it will take for a newly established alfalfa field to reach 50 percent infection of plants. Therefore, rotation of alfalfa to a nonhost crop, such as corn, small grains and sunflower, for a 2 to 4-year period can help reduce populations and slow reinfestation. Currently, there are no nematicides registered for alfalfa to suppress stem nematodes but product evaluation is ongoing. This article appeared in the March 2016 issue of Hay & Forage Grower on pages 10 and 11.